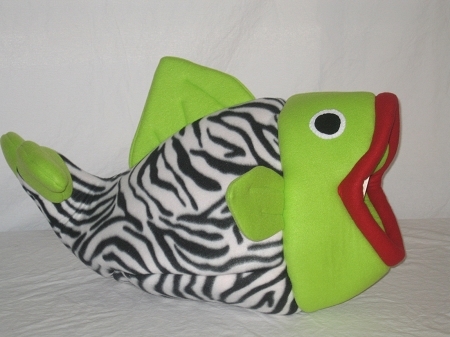 Bring out the beast in your pet with this Zebra flounder. Flounder pet beds are a great decoration for your home and a comfortable bed for your small pet. When the stress of everyday activities gets to your pet, let them relax in the soft comfort of a flounder pet bed. They will feel secure in this safe haven. Flounder pet beds are made of fleece and foam. They are soft, warm and cozy. Flounder inside measurements 19" long, 12" wide the mouth is 9" wide and and 8" high. Very roomy for your cat, ferret, rabbit or small dog. The liner can be pulled out for spot cleaning or to use a lint brush for fur removal or the whole bed can be machine washed. Sewn on eyes are offered for pets who are prone to chew the wiggle eyes off. We have been making flounder pet beds for some years. We have made the mouth bigger allowing more room for your pet. We have perfected the type of foam we use so the mouth stays open on its own. We do not use wire in the mouth to keep it open. The bed is soft for your pet, but the shell is firm to keep its shape. Pet Threads offers many different fabric choices.